As a young kid growing up in Harlem playing team sports and being a professional and competitive dancer, I became a lifelong health and fitness enthusiast at an early age. It was the camaraderie that comes with being on a team or having a training partner and the thought of improving with each session that kept my interest in heath and fitness high. As I got older, I started to educate myself about various health and fitness topics, such as weight loss, diet and nutrition, etc., which allowed my interest to easily grow into a passion. But there was something else that I noticed. Once I fully understood what it meant to truly live and maintain a healthy lifestyle, I realized that a lot of family and friends did not comprehend these behaviors. From processed foods and sugar intake to just knowing how to be active, a lot of people in the Black community were not educated about what it truly meant to be healthy. We all know that in the Black community we have issues with the foods we eat whether it’s from lack of access to better options or just not being aware of the consequences. Unfortunately, observation shows that little progress has been made to help alleviate this issue. Fast forward to 2016, my co-founder, Chris Ketant, and I were researching health stats related to the Black community. What we found was pretty ridiculous, but not surprising. According to studies, 76 percent of us are either overweight or obese and 43 percent of us have high blood pressure. What’s more, most of us who have high blood pressure, are unaware we have this condition. Think about it: That’s 3 out of every 4 family members and friends who have issues with their weight, and a lot of people who don’t realize they’re suffering from hypertension. This is why we created GrpFit (pronounced group-fit). Through the use of our app, which is currently available for iOS, people within the community can have all the tools and resources needed to start, share and complete their health and fitness journey. We wanted to provide a safe space for people to seek motivation, educate themselves on health and fitness topics, connect with others and get sample workouts in a community that lacks the body shaming, trolling and misconceptions you may find on other social media platforms. Get guided workouts that you can do at anytime and anywhere with little to no equipment needed. Share photos, videos and text updates. Read health and fitness articles dedicated to certain topics such as weight loss, training and diet and nutrition. My co-founder and I are extremely proud of what we accomplished thus far, and for being able to say that we are doing something to solve a real issue in our community. But the road to success hasn’t always been easy. In addition, some of these issues still exist for us to this day. Nevertheless, one thing that we can say for sure is that our passion for making our community— the Black community—a more fit and healthy place is the thing that keeps us going. We hope this will motivate you too. I would love to see all of you join the GrpFit community! The app is completely free to download and use and includes most of our workouts. However, if you would like to enjoy a free one-month trial for our Premium services, click on this link to download the app today! 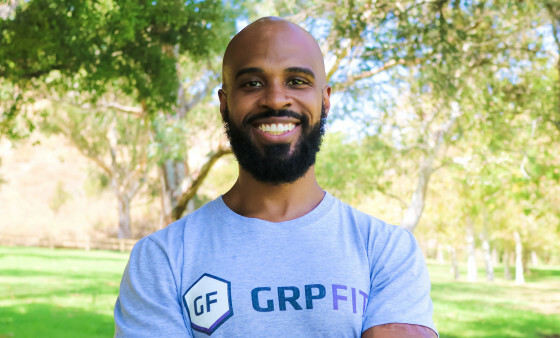 Richard Bailey is the CEO of GrpFit, a fitness platform for the Black community.